And these are Casey's Angels. Some of my friends ask me what is nice about Gold Coast. Is it worth a visit? Well, it all depends on what you are looking for in a holiday. If you're looking for sceneries: mountains, streams, lush green forests, you may find it in Queensland but I didn't include those in my itinerary. My visit was more focussed on the fun aspect: theme-parks, beach, shopping and all. We had all that. 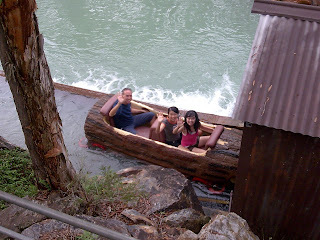 The theme-parks in Gold Coast are very nice and enjoyable. If theme-parks are not your cup of tea then it's just too bad. The waves at the beach are simply awesome. Even though we had no time to learn surfing, just playing in those waves was something we couldn't find in Malaysia. These are some of my favourite pictures of the Gold Coast beach. I'll take a break from now. Enough of the Australia trip. Next time I'll think of other things to blog about.